If ever you’ve watched any natural history shows on TV, you’ve almost certainly heard the term plankton. But have you ever seen plankton? Do you know what they do? “Plankton” actually refers to a group of creatures that float or drift in the the ocean. 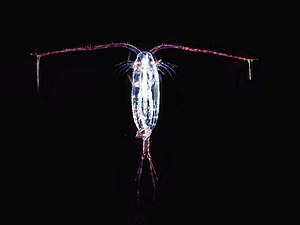 There are phytoplankton (plants) and zooplankton (animals). Small phytoplankton make up the start of the food chain: they are consumed by larger plankton, and then those plankton are eaten by larger organisms, and so on, all the way up to fish and whales. For example, phytoplankton are consumed by krill, which are in turn consumed by blue whales … in quantities of up to 3,600 kilograms of krill a day. Put simply, if there are no plankton, there’s no life in the ocean. A new Zooniverse project, called Plankton Portal, wants to get a much better understanding of where (at what depths, and in what kinds of environments) various kinds of plankton live, and what species distribution looks like. To that end, the Portal wants you to classify what you see in images taken by the In Situ Ichthyoplankton Imaging System (ISIIS). That device contains not only cameras but sensors to measure depth, salinity, temperature, dissolved oxygen, light level, and chlorophyll levels. After completing a tutorial, you’ll be put to work measuring and classifying images of these oddly-beautiful creatures. Don’t worry if you don’t know your copepod from your doliolid yet. Not only do the classification tools come with a field guide, other citizen scientists will be looking at the images you have as well, so that everyone’s work is double-checked. Have fun!